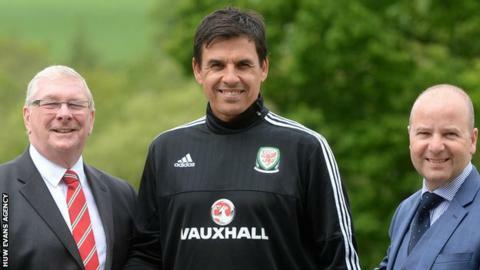 Chris Coleman has held informal talks with the Football Association of Wales about his future as Wales manager. The 47-year-old, whose contract expires at the end of November, met FAW bosses on Thursday, although formal negotiations are yet to start. Wales failed to qualify for the 2018 World Cup this month. In 2016, Coleman said the qualifying campaign would be his last in charge, but has since said he will consider his position before making a decision. The FAW wants the former Fulham manager to sign a new contract, while some leading Wales players also urged Coleman to stay. Coleman has been linked with the vacancy at Premier League side Leicester City, but there has been no formal approach from the Foxes. After Wales missed out on the World Cup qualifying play-offs with a 1-0 defeat against the Republic of Ireland, Coleman said he would take time off before discussing his future formally with the FAW. He signed his current seal shortly before Euro 2016, when Wales reached the semi-finals. Had Wales qualified for the 2018 World Cup, that contract would automatically have been extended until the end of next summer's tournament in Russia. Formal talks with the FAW may not take place until November, with Coleman remaining in charge for Wales' friendly against France in Paris on Friday, 10 November.